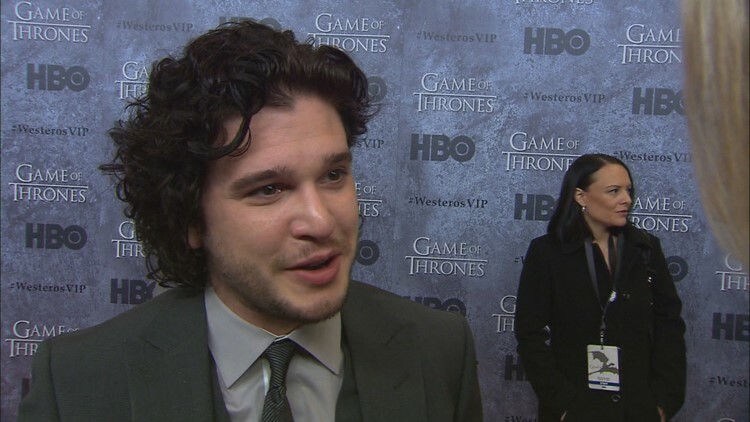 Game of Thrones star Kit Harington suffered a broken ankle right before the start of production on Season 3. Kit Harington plays Jon Snow, a pivotal character, made more difficult to play by a real-life injury, "I had a broken ankle, I bust my ankle quite badly about two months before we started filming." We asked how the injury affected the production, and if it was a bigger nightmare for Kit or for the costume designer who had to figure out how to work around it. Kit told us, “I think it was a pretty big deal for Michelle the costume designer. But trust me, it was worse for me." 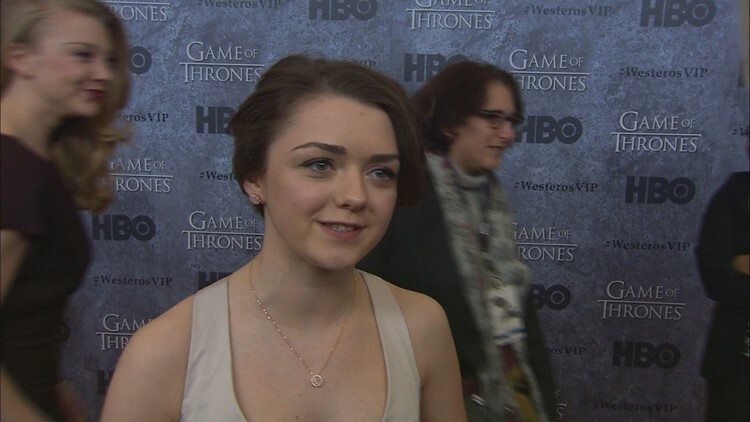 Game of Thrones star Maisie Williams says she is "quite the Tomboy" in real life. Maisie Williams plays his half-sister, Arya Stark, a character who would track dirt all over a red carpet. But is she really a tomboy in real life? We asked if in her personal life we’d find she was a secret ballerina or cheerleader … something super girly. “Well yeah, I am a ballerina but I think my personality, I'm quite a tomboy compared to a lot of other girls, “Maisie said, “I like the rough and tumble and stuff. But when I get all dressed up, I look like a girl which is nice." Season three is billed as the most intense one yet, with even more characters. Actress Sophie Turner, Sansa Stark on the show, said sometimes even the cast finds it hard to keep everyone straight, "I just kind of wing it and I pretend I know who everyone is. Like, you're the bad guy you're the good guy. I don't know your name, but..."
Game of Thrones' Nikolaj Coster-Waldau likened Seattle to Belfast where the show is in production. All the familiar faces are back, too. 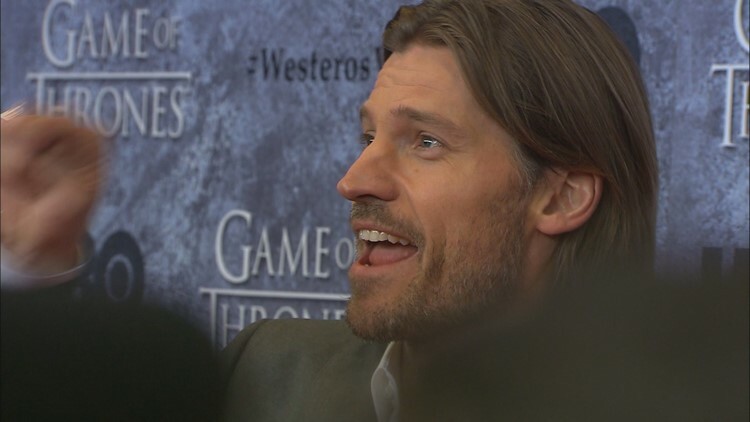 Like bad guy Jaime Lannister, played by Nikolaj Coster-Waldau, who felt right at home in the Northwest, "You know, it's funny. It reminds me very much of Belfast where we shoot. The rain, then it stops for a second, you go ooh, here we go, uhhh. But I went into a cafe and was expecting to be disappointed, but I gotta say the coffee was amazing." Actress Rose Leslie was open to our pitch for moving production for Game of Thrones to the Pacfic Northwest. Seemed like a good opportunity to suggest a change of scenery for season four, so we pitched the idea to actress Rose Lesie, who plays Ygritte. We have trees, vistas, water, “That’s everything they need,” agreed Rose Leslie. Excepting of course, all the snow her character Ygritte might need. “Yes,” she replied, “But I mean it's slightly foggy and rainy outside, so that's perfect."